AODocs can transform an email sent to a specially configured email address into an AODocs document. This article describes the procedure for Team Folder libraries and Secured Folder libraries. Learn more: Create documents from emails in Document Management libraries (in any email client). To create an AODocs document from an email, an inbound email address must first be configured by library administrators. Learn more: Configure emails to documents. Once the email address has been configured, users who can create documents in the library can send an email to this address. The email is converted into an AODocs document and added to the library. You can use any email client (such as Gmail) or any application (such as a printer or ticketing tools) to send the emails. 1. Create a new email and in the To field, enter the specially configured email address. 2. Enter a subject and some text in the main body. 3. Add at least one attachment. Note: You must include at least one attachment. If you send an email with no attachments, the creation of an AODocs document fails. Learn more: Handle attachments. The destination address in the email corresponds to an inbound address configured in an AODocs library. AODocs uses this email address to convert the incoming email. The default properties associated with this inbound address will be applied to the converted document. The From address becomes the document creator. The Subject and the body of the email become the rich text Description of the AODocs document. The HTML formatting in the email body is preserved in the AODocs document unless your administrator chose the plain text setting. Learn more: Configure emails to documents. If there is one file attached to the email, it is attached to the AODocs document. 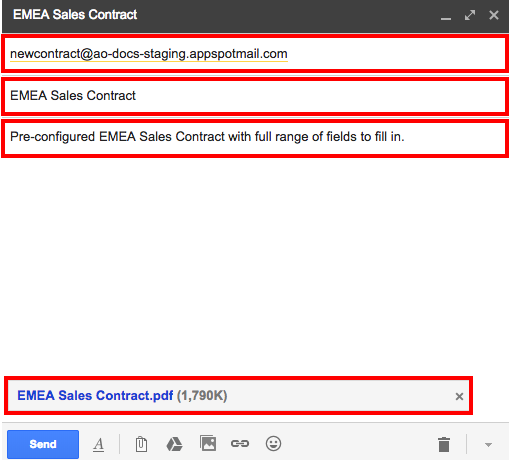 If there is more than one file attached to the email, separate AODocs document are created for each attachment. The attachments are saved to Google Drive. The name of the attached file become the title of the AODocs document. If a library administrator has associated a document template with the email address, the document created in AODocs will have the default properties of the template. 5. When the conversion is complete, AODocs sends a confirmation email to the sender. The email provides a link to the new document. 6. Open the document in AODocs. - If the document class has a default template and a library administrator hasn't associated the email address with a template, the new document is created using the default template. - If a library administrator has associated the email address with a folder, the document is created in the defined folder. If no folder is associated with the email address, the document is created at the root level of the library. - Library administrators can force Microsoft Office files to be converted to Google Docs format. - The total size of the email sent to AODocs is limited to 24 MB, including the email body and all the attachments. If you send an email with no attachments, the creation of the AODocs document fails and you receive an error message. 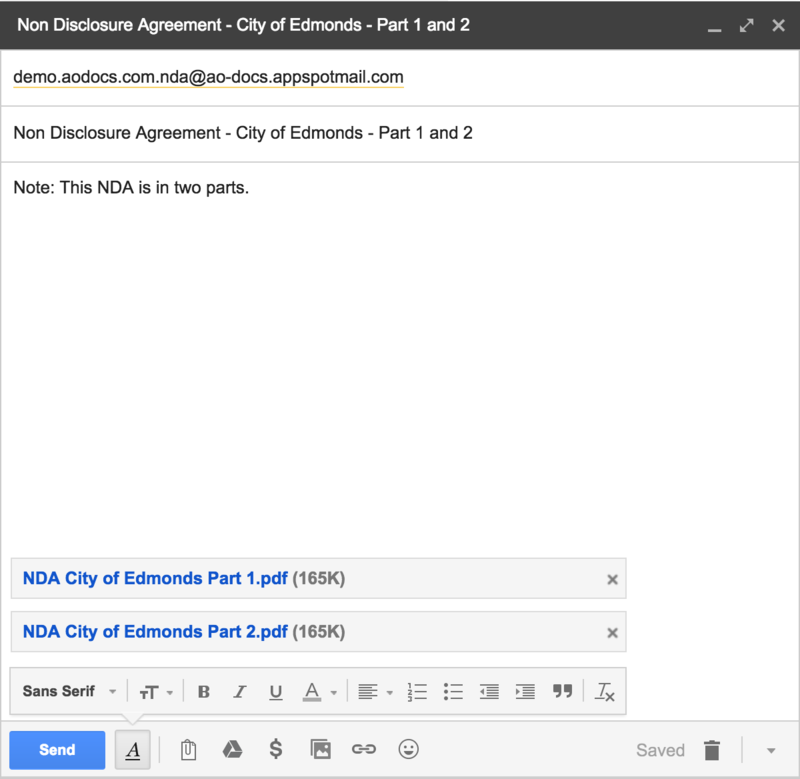 If you send an email with several attachments, AODocs creates one document for each attachment. The From address of the sender's email is used to determine whether the document can be created by the email sender. AODocs checks if the email sender has the permission to create documents in the library. If not, AODocs sends an email to the sender containing an error message.